Pattern from 1955 described as a "lacy head scarf for evening wear". 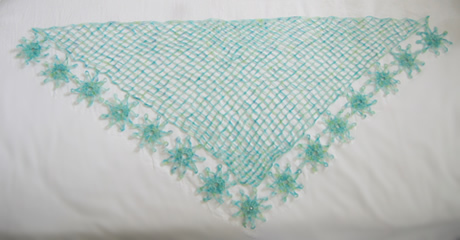 This is a charming fichu, for evening, or indeed day wear, depending on your choice of yarn type. I don't know about you, but I try not to wear head scarves in the evening; in fact I try not to wear them ever. I took against them in the 1970s - something to do with the image of the Royal Family - o, and they make me look like an extra from an Edinburgh Fringe production of Mother Courage. Hopefully, however, this one will make us all look like Grace Kelly. Begin at the widest part. With No. 11 (the larger) hook make 260 chain, very loosely. Row 1: Miss 1ch, * 1dc in next ch, 7ch, miss 5ch; repeat from * to last chain; 1dc in last ch; turn. Row 2: 4slip sts in next 4ch, * 7ch, 1dc in centre of next 7ch loop; repeat from* to end, turn. Continue, repeating 2nd row, thus decreasing one trellis pattern on every row, until only one trellis pattern remains to be worked in the centre. Flower border - With No. 12 (the smaller) hook make 12 chain, and join in a ring with a slip st.
First round: 3ch. (this counts as one dbl tr), work 26 dbl trs through centre of ring, and join to top of he 3ch with a slip st.
Second round: * 16ch, 1ss into 10th ch from hook, 6ch, miss 2 dbl trs, 1 ss into next dbl tr. Repeat from * to end. Fasten off. Make 14 more in the same way. Making up - Press lighty on the wrong side under a damp cloth. Make a long strip of flowers by joining (sewing) the tip of one petal of one flower to the adjoining tip of petal of another flower. Join this strip to sloping sides of main part - seven petals along each side, and one at the top of the triangle; catch the tips of two petals of each flower to the main work to secure the border. Give a final press, pinning out the flower points. Original pattern calls for a ½oz ball of "Fine Ply". Example in hand-painted cobweb lace wool (100m skeins about 9g) purchased from Alchemy Fibre Arts eBay shop. Numbers 11 (3mm) and 12 (2.5mm) crochet hooks. One trellis pattern measures ¾in on no. 11 hook. Approximately 36 inches at the widest part. There were quite a few patterns for very fine scarves and shawls in cobweb wools, and as their name suggests they are very fine gauge. You could knit this in other yarn weights - for example, Rowan Kidsilk Haze - and simply produce a fichu of a different (larger) size. Now you have the taste for chic yet casual evening wear in adaptable crochet, I expect you'll want to embark on a larger project (such as the one below) to extend your skills. Let me know if you need the pattern.